Grilling is a great way of cooking meat and many are getting into the idea of grilling using lump charcoal for their barbecuing needs. In this post, we will be reviewing some of the best lump charcoal on the market today, including lump charcoal for grilling and smoking. We will also discuss the different benefits of using lump charcoal and how to choose the best one for your wonderful grilling experience. Is Lump Charcoal Safe for the Environment? How to Choose the Best Lump Charcoal? The Fogo FHWC35LB is a premium hardwood lump charcoal and also the best lump charcoal for Big Green Egg or Kamado Joe grilling cookware. This product is 100% natural lump charcoal and has no other chemicals or additives. So, you’re insured with a clean and natural burning fire that will make your food taste even better. This lump charcoal is made from dense Central American Oak Hardwood trimmings with hand selected pieces placed in the bag. This makes sure that you get the top quality lump charcoal pieces you can use for cooking, although some users say that they find the pieces a little too big. However, you can try to cut to your desired size if needed to. 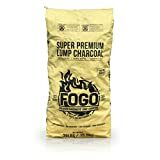 Fogo lump charcoal lights fast and can be ready to grill within 15 minutes. Lighting it up is easy without the need to use lighter fluid. Simply build a pile of lump charcoal and place a vegetable oil-soaked ball of kitchen paper towel underneath. Since it is dense and easy to light, it can burn hotter and longer than any regular charcoal. This product is great for grilling or cooking any type of food like meat, fish, chicken or even vegetables. With this, you are also sure that this product is restaurant quality because it is used by many restaurants to cook their food too. Overall, the Fogo FHWC35LB premium lump charcoal is definitely the best lump charcoal for kamado cooking stove like the Big Green Egg. The large sizes of charcoal are great for long and slow cooking because it burns longer. Original Natural Charcoal is another 100% natural hardwood lump charcoal that blends apple, cherry, and oak trees that emit a sweet aroma, warm and add a fruity flavor to the meats. It makes your food more delicious and smoky with a sweet flavor which is perfect for beef, poultry, game birds, and pork. The Original Natural charcoal is easy to light up. All you need is one and a half sheet of paper to start the fire and you are ready to grill in 5 minutes. You don’t need to use lighter fluid or oil at all. This lump charcoal produces less smoke, sparks, and produce minimum ash so you grill more safely and cleaner. This charcoal is chef-grade and specially designed for grilling and barbecuing. Most charcoal grills are not hot enough because the burning charcoal does not produce sufficient heat and this tends to dry out the meat when cooking. But when you use this, the flame from the burning charcoal is hot enough to sear the outside and keep the juiciness of your meat inside. One drawback that some users experienced is that there are quite many broken pieces of charcoal in the bag. However, what they liked about it is that the pieces aren’t too big or chunky to use which makes starting the fire easier and the broken pieces are excellent for starting the fire easier. This is one of the highest-rated lump charcoals on Amazon and many users like how it lights easy and burns hot enough to sear. The manufacturer even guarantees 100% sizzling feature for your meats or 100% refund within 30 days, which is why we think this is the best lump charcoal for grilling. Refer as the “wicked good” charcoal, the Jealous Devil lump charcoal is an excellent product for smoking and grilling that comes in restaurant quality, meaning you can create amazing food from the comfort of your own home. Its premium ingredients make it burn with less smoke, sparks, and produce less ash for easier clean up than your regular charcoal. The bag is made of heavy-duty 3-ply Kraft paper bag that store the charcoal safety do not easily tear apart. In the bag, you’ll find large sizes of lump charcoal and reduced dust, so you have less waste and a better grilling experience. Since it’s 100% natural, you don’t get chemicals, fillers, or even scrap wood, keeping your food safe. Jealous Devil uses dense Quebracho Blanco hardwood which is also known as “axe breaker” throughout South America and as one of the hardest woods. The brand uses this because dense wood is the best for charcoal grilling. This premium quality wood leaves your food tasting amazing with a mild grilled flavor. The charcoal can burn over 7000cal/g which is extremely hot. It burns twice as hot and three times longer than a traditional charcoal so you get your money’s worth. Some user commented that the charcoal burn longer. They have up to more than three hours of burn time making it a more cost-efficient product. Another thing we liked about Jealous Devil is that they care about the environment and use sustainable wood for making their lump charcoal. Despite their growing demand, they have never cut a tree just to produce charcoal. We like this product and would recommend it as the best lump charcoal for smoking and grilling. Grill Dome Choice lump charcoal is another great option for kamado-style grills. Just like other lump charcoals, this is also made of 100% natural mixed hardwood without additives and fillers. So, you’re sure that you grill without dangerous chemicals leach into your food. This lump charcoal burns hotter, longer and cleaner than traditional charcoals because the pieces are larger to make burning last longer. This makes it equally great for smoking food and for slow cooking and is effective in keeping the flavor of your food intact. Although, one negative thing about this is that only ¼ of the pieces in the bag are large chunks. Because it uses different kinds of wood, it is ideal for different types of smoked and grilled dishes. It leaves a nice smoky flavor to your food without the chemical taste some charcoals impart. A large 20 lb bag can be used for many months and doesn’t leave too many ashes and small pieces. Grill Dome lump charcoal is a great value for money and is definitely one of the tops selected lump charcoal in the market. If you are not looking for a specific wood flavor on your food then this is a great option that doesn’t compromise the food’s taste. We go through hundreds of products listing at Amazon and also study the ratings left by previous buyers to find the best lump charcoal for you. Besides that, we also calculate the overall net ﻿﻿customer satisfaction (NCS) grade because we want to see how happy is the previous buyers with their purchase of the product. From our finding, we can say that charcoal by Original Natural is the best lump charcoal brands. This brand is popular and received many excellent ratings for their products. Also, the Original Natural Charcoal score favorably for the ratings as well as the NCS grade compare to the rest. We believe that you would find these lump charcoal a good buy too. Lump charcoal is produced by burning out pieces of dense wood until all the water, sap, and moisture are gone. After that, what’s left is a less harmful lump of charcoal that responds well to oxygen when burning. Furthermore, lump charcoals do not contain chemicals or additives so it’s the cleanest and safest way to grill. In general, lump charcoal uses natural materials compared to briquettes, therefore these do not use chemicals and additives. However, it can be more expensive than briquettes. But what’s great about these is it’s easy to light and the burning time is usually longer because of the dense hardwood material. Other than those, it emits less smoke and ash so it’s easier to clean. Briquette charcoal is wood that is processed and pressed into blocks. Many of the briquette shape and size is made to look nice but it contains carbon and additives to help it burn. It’s also known to produce more ash during cooking so people are worried about it going to their food. Price wise, it is cheaper than lump charcoal but the downside is less clean. Burning charcoal is not 100% eco-friendly because it can emit high levels of carbon dioxide, propane, and other chemicals. And most traditional charcoals use regular branches, wood, or twigs from trees, and even lumber scrap. However, lump charcoals have lower levels of carbon footprint compared to traditional charcoal and there are even some brands that use sustainable wood. In short, this means manufacturers don’t cut down trees just to produce charcoal. Other than that, they use premium quality dense hardwood that burns less smoke. Most lump charcoal is made with natural ingredients, but it’s also important to know what these are specifically. Make sure that the bag of charcoal is properly labeled with its ingredients such as 100% organic and natural hardwood, no chemicals and additives, etc. Some even specifically state what kind of wood they used like cherry, mesquite, apple, oak or hickory. Naturally, you will light your charcoal before you grill so one thing to consider is the ease of lighting the lump charcoal. Some can light easily without the use of gas or lighter fluid and can be as fast as 5 minutes. You do not want to spend 30 minutes just to light up the charcoal, do you? Ash will be produced by burning a charcoal. For easier cleaning, make sure to choose the lump charcoal that produces less ash feature. This is possible with dense hardwood charcoal that does not break into ashes during burning. Smoke affects the amount of flavor that the lump charcoal imparts on your food depending on what type of wood it is. This is more applicable to those who use lump charcoal for smoking food. Sometimes the more smoke is produced from burning the charcoal, the tastier the food will become. Lump charcoals are generally more expensive than briquettes but because these are denser, a bag can last for months. Build a charcoal pyramid where large size charcoal is underneath and smaller size stack on top. Pyramid shape makes starting the fire easier and quicker. The center hollow space allows you to put a fire starter to assist in starting up the fire. Assess how much heat your food will need to determine how much charcoal you should use. Burning excessive charcoal will not help in cooking and worst, it might burn the food. Make use of the vents on your grill to control the heat. Do not keep on lifting the lid just to check the temperature. Use a grill thermometer instead. The Therm﻿oPro TP20 is an excellent wireless remote digital cooking thermometer for all your grilling needs. Do not attempt to clean burning charcoal after cooking. Pour water on the charcoals and stir it gently. Let them soak for a day so that it’s easier to clean. Using lump charcoal for grilling will definitely make your food tastier, healthier, and safer to eat. Based on our research and reviews, they are better than using briquettes despite being more expensive because they are earth-friendly, easier to light, cleaner, and longer lasting. When you’re out to buy the best lump charcoal, choose a bag of charcoal that has all the information you need. Pick an all-natural premium quality dense hardwood lump charcoal. This can benefit your food and make it tastier and juicier. We particularly like Original Natural Charcoal because of its perfect size, wonderful scent, and long burning time. Also, the Ozark Oak is great too. Unfortunately, news about the Ozark Oak lump charcoal company is closing down. If you still have Ozark Oak stocked in your garage, that might be the last stock you ever have left.